Made for Big and Wide People! Are you looking for a porch rocker that is built with plenty of room for an up-sized body? No more squeezing into small porch rockers – we have the Big and Wide Hickory Porch Rocker that you’ve been looking for! Our Amish made hickory wood porch rockers are handcrafted in the USA. This sturdy, durable and comfortable Big and Wide Hickory Porch Rocker will make an excellent addition to your home. 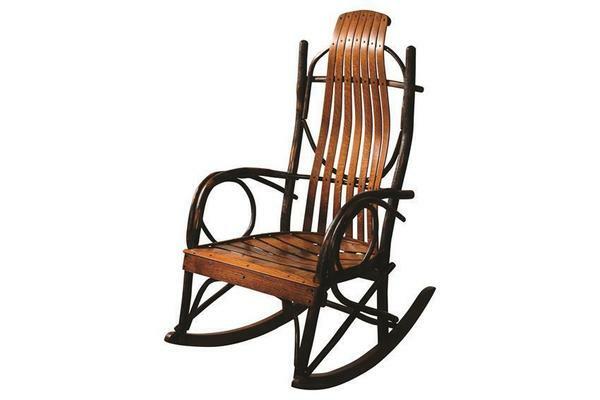 Relax in style and comfort in this beautiful Amish Hickory Rocker. It will be an heirloom rocking chair in your family, passed on from generation to generation. The Big and Wide Hickory Porch Rocker usually ships in 5-7 weeks. Questions? Call DutchCrafters at 866-272-6773 to speak with a friendly furniture specialist who will be happy to help you. Floor to top of seat: 17.5"
Seat to top of chair back: 31"